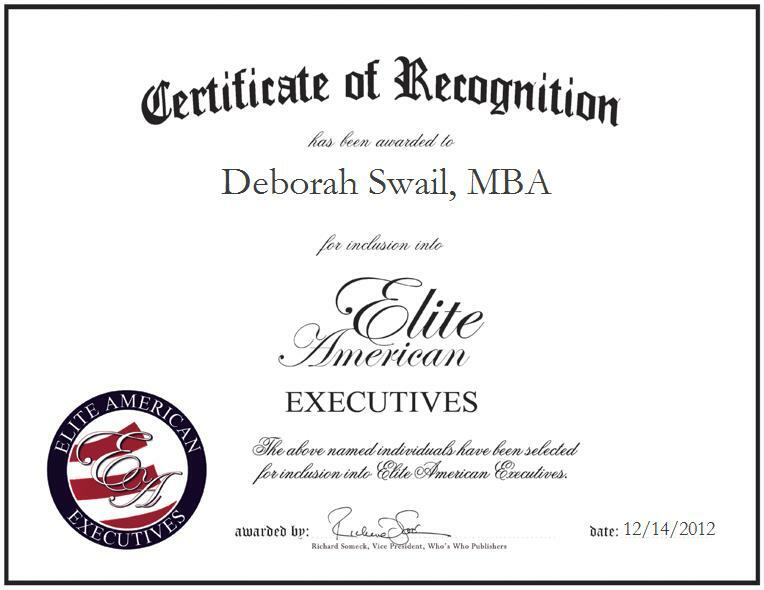 NORTH YORK, ON, CANADA, December 14, 2012, Deborah Swail, MBA, Vice President of Business Transformation and Governance for Foresters, has been recognized by Elite American Executives for dedication, achievements, and leadership in financial services. Ms. Swail is a Senior Financial Services Executive with over 30 years experience in business strategy development, human resource management, change leadership, project management, contract negotiation, training design and facilitation. She is currently Vice President of Business Transformation and Governance at Foresters Insurance, Canada where she is currently responsible for the transformation that is taking place at Foresters Insurance involving nine initiatives, $60 million, and encompassing the redesign of business processes, which includes the operation of back office, insurance operations and taking the organization from the fully manual process of administering policies to an automated process. She also looks after project portfolio governance and the outsourcing of project management to CGI. She manages governance over projects ensuring guidelines are followed and overall health of the portfolio. Ms. Swail has a background in human resources, risk management, and sales, as well as the ability to understand business and people. She is a senior financial services executive with more than 30 years of experience in business strategy development, human resource management, change leadership, project management, contract negotiation, training design and facilitation. With a wealth of knowledge and experience acquired over the course of a career that has spanned nearly four decades, Ms. Swail attributes her success to having a breadth of experience, which gives her a better perspective and understanding of issues, as well as broader view. She would also like to credit the support she receives from strong champions. She became involved in her profession through her interest in the field and work at hand, as well as the fact that her boss is someone with whom she has previously worked. In looking forward to a bright professional future, Ms. Swail hopes to be successful in this program by delivering and implementing benefits.